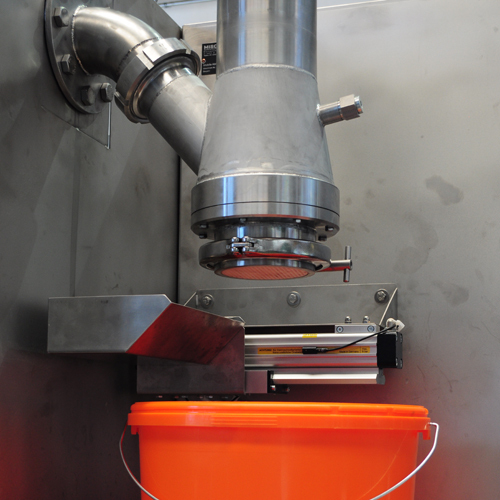 Modern production plants call for efficient filling devices. Alternating container sizes and frequent product changes can be challenging. Individual solutions are our forte. Flexibly combinable and simple basic modules up to state-of-the-art robot and gripping technology make it possible to process your product safely and quickly. Special presses and press out devices tailored to the Production vessels allow the vessels to be emptied almost completely. Pressures of up to 100 bar can be achieved. Emptying of 200-litre steel barrels with or without beads, alternatively with support casing trace heating and an exhaust port. Pressures of up to 10 bar are possible. Closed piston accumulators with a special piston sealing to continuously feed the filling plants and as buffer storage to constantly operate the mixing extruders. Pressures of up to 30 bar can be achieved. Tailor-made filling plants for fluid and pasty products. State-of-the-art camera technology allows containers to be changed over without the need for mechanical intervention. Our portfolio ranges from manually controlled filling valves on platform scales to fully automated plants for the filling of various containers, which include the automated supply of the empty containers as well as the removal of the filled and sealed containers. Mixing technology made to measure.